IF you buy one jazz album this year, it should be this. Inspirational Sydney saxophonist Sandy Evans has had since 1996 to compose her response to her musician husband Tony Gorman’s diagnosis with multiple sclerosis. Taking the rainbow as a symbol of finding hope in suffering, Evans has created a musical journey that evokes life’s myriad hues and states of mind. From the wistful, yet sprightly title track, through Heedrum-hodrum headbanging’s irrepressible complaint and the grim humour of Alexander’s Dark Band to the trumpet lament of Broken and blessed relief of Indigo Hues, Evans and her brilliant ensemble tell a story that is surely best experienced as a whole, with no distractions. This review also appeared in the Play section of the Sunday Herald Sun on September 18, 2001. 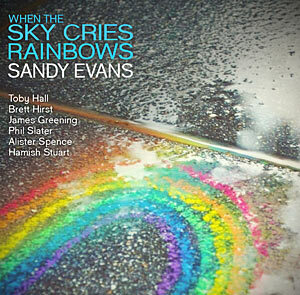 This entry was posted in CD REVIEWS and tagged CD reviews, ce review, Sany Evans, Tony Gorman, When the sky cries rainbows. Bookmark the permalink.